The other day I mentioned on Instagram how I felt I was experiencing the winter blues. Is that even possible if you live in a tropical place? I really like my sunshine and it’s been really dreary here, okay?! ha. Pretty sure I found my cure though! Online shopping all the colorful items for a pretend Spring Break Getaway! I would wear/use all of these items during SB and well into summer! Over winter I always feel so uninspired clothing wise, especially creating blog content. My winter wardrobe just isn’t that vibrant and it makes me a bit sad. I live for color you guys! Like it makes my blood pump and truly gives me so much happiness. Especially when an item is colorful and coastal inspired. All of thees items are perfect for a SB beach vacay, an upcoming cruise or tropical trip. Even if your not going on a sunny Spring Break trip, save them for summer! 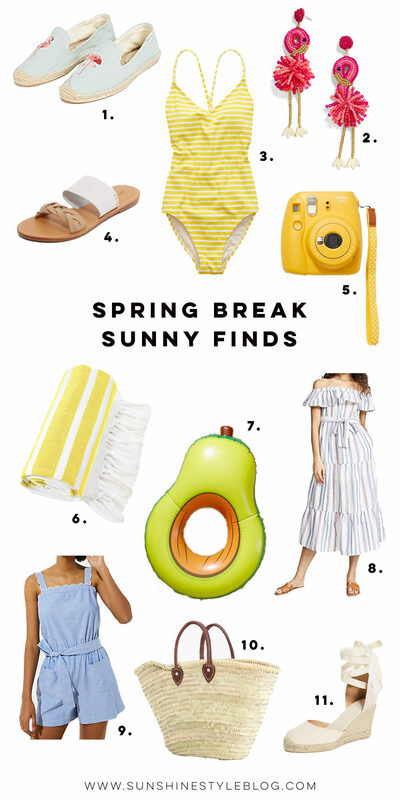 I was made for summer and so are you because your here (obvi) and so are all of these sunny Spring Break finds below! 1.Flamingo Espadrilles // I own these Soludos shoes except mine have an avocado logo on them! They are one of my most commented on items that I own. The shoe itself is super comfortable and the material cleans up easily! 2. Flamingo Earrings // Flamingo. Earrings. Do I need to say anything else?! These are self explanatory and would look so cute with an all white dress! 3. Striped Swimsuit // Pretty sure we can all agree stripes are life and the best! 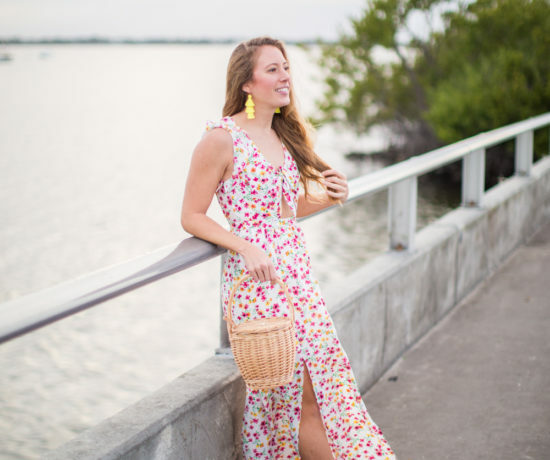 They never go out of style and is the perfect classic suit to wear all summer! Plus, the $40 price tag can’t be beat!!! 4. 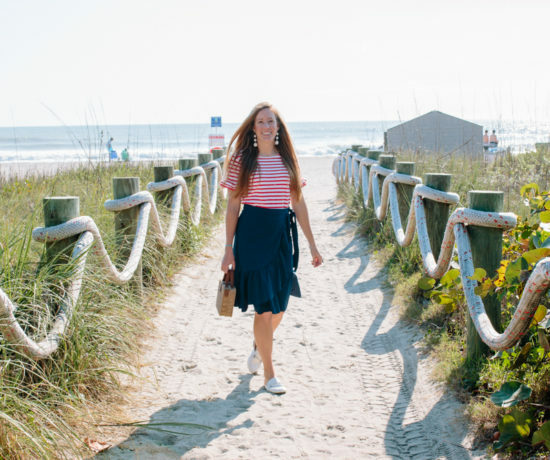 Woven Sandals // I adore these easy to slip on sandals for beach walks or casual dinners enjoyed outside. To me, a neutral white sandal in the summer is a must have! I can guarantee my white sandals are my most worn shoe during Spring/Summer, especially with dresses and shorts! 5. Instax Camera // Now this camera is just pure fun!!! I have one and so does my BFF! We both actually bought each other new film for Christmas and love shooting cheesy photos when were together. Use it to take photos or style it in your SB photos! 6. Hand Woven Towel // Is it me or is finding a cute pool towel seem like the hardest thing? Usually I end up going the cheesy route with my towels and buy really bold and bright prints. It’s refreshing to finally see a towel with such a classic and colorful print! No cheesy stripes here. 7. Avocado Float // I already own a giant flamingo float, a bull riding, watermelon and orange slice. Why not add an avocado to that list?! The seed comes out in the middle, so you can wear it like a ring around your stomach. The real reason I want this float? Just to take funny photos but I would still put it to good use! 8. Ruffle Off-the-Shoulder Dress // Yes to more classic stripes! I love the midi style and ruffled off the shoulder top! 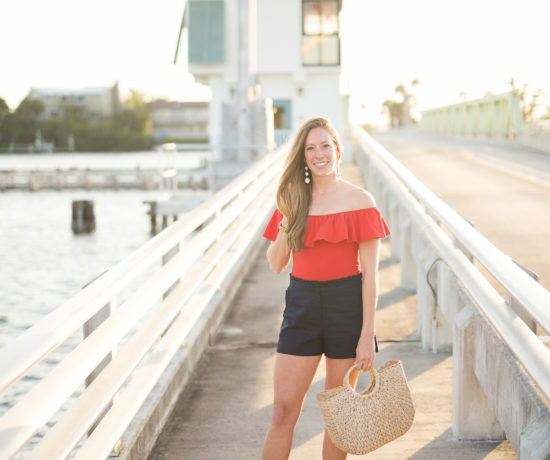 Pair the beach bag and woven sandals during the day and swap out wedges for night and you have the perfect vacay outfit! 9. Chambray Romper // If there’s an item I love, it’s a great romper! I really like the front pockets and when I say chambray matches with everything, it’ matched with everything! 10. Straw Beach Bag // This bag is stored away in my closet waiting for it’s first beach day of 2019. I am totally for beach bags and think everyone should own one! Throw all your beach essentials in them and your all ready! 11. Tie Espadrille Wedges // Now these are probably the most comfortable wedges I own! Really, the soles are squishy and the shoe is very easy to walk it! Style these with the stripes off-the-shoulder dress for a romantic date night or wear after a long day in the sun. 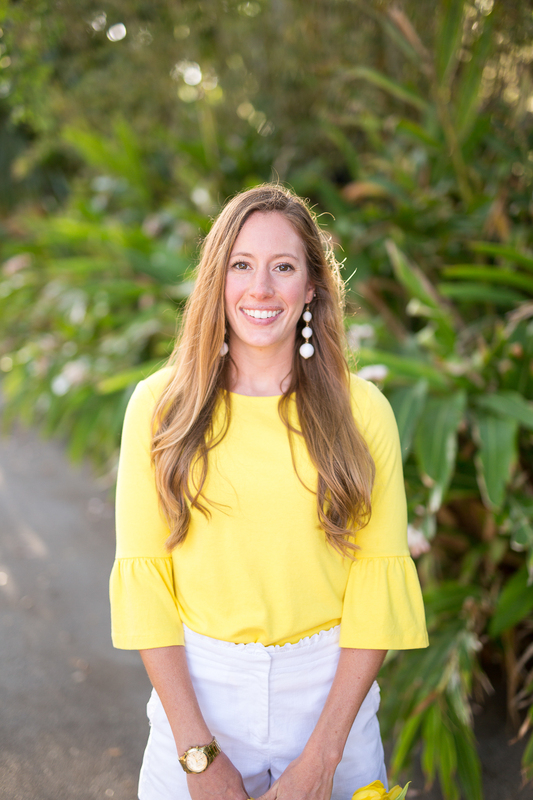 Whats your favorite Sunny Style Find!? Do you have a fun trip planned for the Spring? Let me know in the comments so I can live vicariously through you! Thank you so much Erin!!! =) The lemon shoes are super cute!!!! I have avocado ones also and always get so many comments on them! So cool! 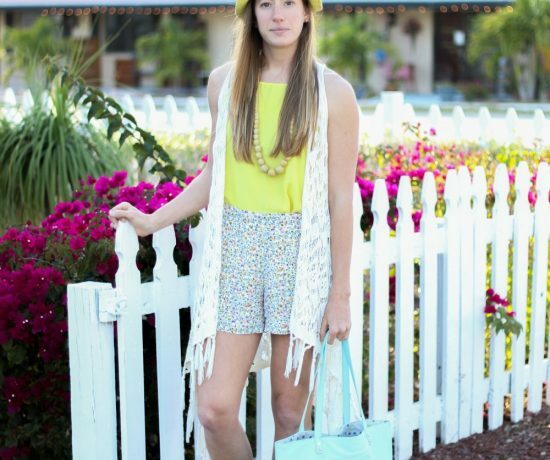 I am actually going to be featured on Carly’s blog mid Feb all about Spring Break style. Be on the lookout! That is the most perfect swimsuit ever!!! thank you so so much Haley! It fits amazing! Yes it is! It fits like a dream!!! I’ve worn it at the beach and it stayed in place when I played sports!